A cool, creamy and summery tomato soup with a surprise secret ingredient that brightens the flavor. This recipe was inspired by a chilled tomato soup I had at a restaurant recently that tasted brighter, sweeter and more intensely of tomatoes than any other tomato soup I’d ever tried. I couldn’t quite put my finger on what was in it, so I asked the waiter and he told me the secret ingredient was orange juice. The orange juice highlighted the sweetness of the tomatoes and livened up the taste of the soup without calling any attention to itself. Brilliant! Now that you know, you’ll taste it but ask anyone to guess what’s in it and they’ll have no idea — they’ll just love it. Begin with the garlic. Place each clove underneath the flat side of a chef’s knife and smash it with the palm of your hand — the peel will come right off. You don’t want to chop the garlic because it will burn if the pieces are too small. Next, roughly chop the onions and carrots. Cook the onions, garlic and carrots in olive oil until softened and just starting to brown, about 15 minutes. Add the tomatoes, water, orange juice, sugar and salt. Toss in some fresh basil leaves. Then cover and simmer for about 25 minutes. Purée the soup using a hand-held immersion blender (or in batches in a blender) until completely smooth. Stir in the cream. Don’t worry — there’s only a third of a cup in the whole pot. A little goes a very long way! Finally, chill the soup in the refrigerator until very cold. Ladle the soup into bowls and top with fresh chopped basil, or garnish with whole basil leaves if desired. Enjoy! Heat the olive oil in a large pot over medium heat. Add the onions, carrots and garlic and cook, stirring occasionally, until vegetables are soft and just beginning to brown, about 15 minutes. Add the tomatoes, water, orange juice, sugar, salt and basil and bring the soup to a boil. Turn heat down to low, cover and simmer for about 25 minutes. Purée the soup with a hand-held immersion blender until completely smooth. (Alternatively, use a standard blender to purée soup in batches. Always be careful not to fill the jar more than halfway, and leave the hole in the lid open and loosely cover with a dish towel to allow the heat to escape.) Stir in the heavy cream. Taste and adjust seasoning with salt and/or sugar if necessary. Transfer the soup to a container (or leave in the pot if you wish) and refrigerate until very cold. Ladle the soup into bowls and top with fresh chopped basil. Garnish with whole basil leaves if desired. Freezer-Friendly Instructions: The soup can be frozen, without the cream, for up to 3 months. When ready to serve, add the heavy cream and stir until fully combined with the remainder of the soup. Love tomato soup. When I have an over abundance of tomatoes in my garden I freeze them and take out what I need for this soup all year. I use almond milk instead of cream and I can’t tell any difference. I double this recipe and freeze for future lunches or dinner. I live in Colorado and love tomato soup on a cold day! This recipe is great especially with a grilled, buttered telera roll. I did alter a couple ingredients to my liking…first I used fresh tomatoes and reduced the orange juice to 1/2 cup. I highly recommend trying this recipe!! I absolutely love your recipes and would really like to try this one, but I’m not able to have dairy. Do you think it would still work well if I left out the cream? Hi Natalie, It’s fine to leave it out. Enjoy! I liked this soup, but for my palate the orange juice flavor was too strong. I may try next time with fresh squeezed juice (I did use not-from-concentrate) and reduce significantly to 1/2 cup rather than one and one half cups. Can I make this with sour cream instead of heavy cream? Hi Ziesi, for the best results, I’d stick with the heavy cream here- sorry! How much is a serving size? One cup? Total recipe 6 cups? Stella, I think a serving would be more like 1 1/2 cups. Enjoy! I followed this recipe but also added fresh parsley and thyme. Served this hot with grilled cheese sandwiches for a cozy winter supper that everyone loved. Very good! I used fresh tomatoes, because we have a ton of them right now. That said, I think I will adjust the recipe a bit next time to account for the sweetness/tartness/whatever of the tomatoes themselves. A little less sugar would have been better with the ones I have now, but it will always be different. I served the soup (hot) with fancy grilled cheese sandwiches. My family was impressed! I’ve recently started to eat paleo. It’s hard to give up grains, but this soup works. Good in winter and summer. Hi Jenn! This is my daughter’s favorite kind of soup. She always gets it to go from a place in town. 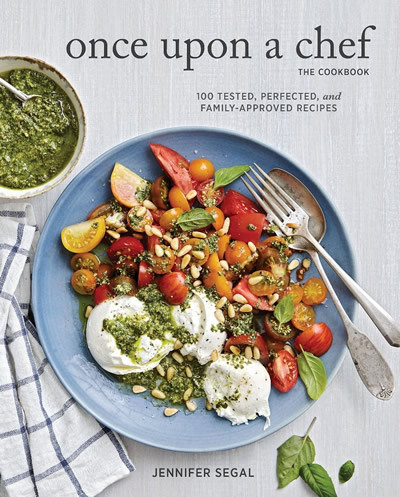 I want to make this for her since all your other recipes are amazing!! Can I serve it warm? She will give me ‘that look’ if I give it to her cold. 2% milk and serving it warm was just really just as good as the time I made it with heavy cream and served it cold. My family could barely tell the difference. Great versatile recipe for all seasons. Doesn’t the oj make the cream curdle? I made this recipe exactly as described and was not happy with the texture. However being an experienced cook I realised that putting twice through a sieve was all that was required. The resulting soup was perfect, a delightful flavour and a superb texture. Inexperienced cooks may not be aware of what is required re texture so I feel the recipe would be enhanced by this simple addition. I do thank you so much for this dish, my dinner guests loved it and I will make it again. Just as the recipe called for and ADDICTIVE – cold or warm! The tomato soup looks delicious. I am going to beg my wife to make some soon. Thank you. This has my mouth watering!! What a beautiful soup inspired by the flavors of summer! I would like to use fresh tomatoes – how many should I use? Hi Rachelle, You’d need about 3-1/4 lbs. Hope you enjoy! Orange Juice???? Yes..that would be amazing! Made a half recipe of this yesterday to have on hand for weekend lunch and to take to work for lunch next week. 1/2 recipe made quite a bit of soup. Served with Rosemary bread from Trader Joe’s. I will cut down on the amount of OJ next time. I used 3/4 c. but it was a little too much orange flavor in the soup for my taste. With tomatoes in season, would you recommend any particular variety? I’d like to try this with garden- or farmers market fresh. Can this be made with low fat half and half instead of heavy cream? Hi Renee, I’d stick with the heavy cream…just maybe use a little less. Can’t wait to try this recipe! If I use fresh tomatoes, how many would I need? Hi Mimi, You’d need about 3-1/4 pounds. I am going to try this soup today. A restaurant in town serves the very best Tomato Basil Soup only hot and they won’t divulge the secret ingredients. other than tomato sauce, basil and cream. I am wondering if orange juice is the secret ingredient. Also, I would like to know if this soup is good served hot. Hi Martha, It is good hot, but I think it’s better cold. You might try my Classic Tomato Soup if you prefer hot. I want to make this for 3 people and if I cut all ingredients in half would the recipe work? Is this soup also good cold? Hi Virginia, This soup is meant to be served cold. 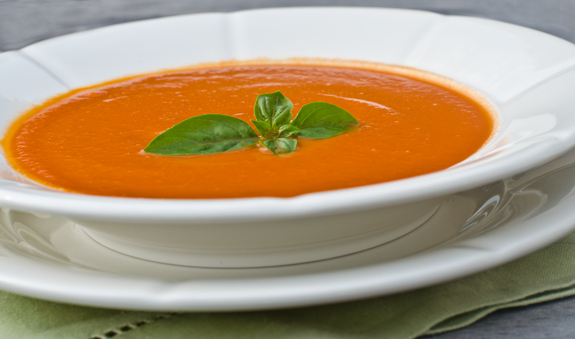 For a hot version, check out my classic tomato soup. This sounds delicious, I wonder if it could be served warm?